Think about her state of mind. You’re her bestie, workout buddy, non-certified life coach, and closest confidante. Before you approach any wedding-related topics, think about how she handles stress, and what she’s shared with you about the wedding to this point. 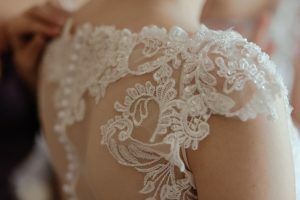 Be sensitive to the things currently running through her mind, wedding-related or not—from a tight wedding budget to work drama to a goal dress size she can’t currently fit into (but really wants to by wedding time). Study her style. Start with what’s in her closet and note her go-to pieces. What does she wear when she’s killin’ it at work or headed on a big date? What silhouettes feel the most like her (regardless of how “dressy” they are)? These are the styles and shapes that’ll flatter her most and give her the least headaches in the fitting room. Gather photo evidence from Facebook and Instagram to help get keep her on the right track when she’s at a loss for what her style really is. Get with her “vision.” Regardless of your taste (or even what she usually wears) her “dream” dress may be something you’d never guess. (Like, ever.) Cruise her Lover.ly bundles and note the recurring fabrics, shapes, and styles. This will come in handy when you find yourself surrounded by dresses that look good (to you) and should be grabbed or skipped based on her ideal dress. Stalk. All. Sample sales. Part of the fun of wedding dress shopping for a friend is that you’re not the one flipping expensive get-ups over your head for hours. So take an active role and sign up for sample sale lists. Track good-looking options on eBay and NearlyNewlywed, and schedule brunches and yoga seshes near boutiques she’s yet to visit. Many brides find “the dress” on a day they weren’t expecting to, so make an effort to keep “the hunt” as low-maintenance as possible. Go with the flow. Many brides pre-shop their appointments alone—or with just one friend—ahead of opening the flood gates to cousins, grandmothers, and close friends with questionable taste. Should you find yourself in a group appointment (and, for the record, most shops cap it at two guests for good reason), establish your lane beforehand. Have a quick chat about what she wants you to say (or not say) once opinions start flying. Be prepared to say what’s on your mind—but don’t be offended if she asks you—just this once!—to save what you really think for later when it’s just the two of you. Remember (and respect) her ideal budget. Before you hit the streets to shop, confirm what she’s comfortable spending—and help her stick to it. There are enough pushy salespeople and over-opinionated acquaintances to fill her venue. What she’ll love you for is your help walking away with something she loves—and that doesn’t send her to the poorhouse. Speaking of money…help her negotiate. While she’s in the fitting room, you can help her get a better deal on her dress. 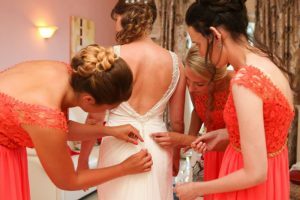 Paying cash and pre-paying for dress preservation or in-house alterations (if she was already planning to have those done) are all common services to bundle together and can cost less than if she has them done at different times. If she loves the dress but you don’t… Unless you think she’s going to go into irrevocable debt, she’s prone to buyer’s remorse, or she’s buying something she’s going to have to starve herself to get into…zip it. Oh and one last tip… Bring an extra $20 along just in case she finds the dress on your watch. A moment like this calls for something bubbly. Bottom’s up! You’ve got a wedding to help her plan, so you’re going to need it! Ready to start shopping? 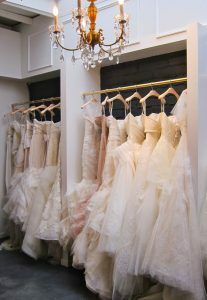 Browse gorgeous wedding gown posts on Lover.ly!